The 2nd day we had to wake up at 7am to get to the airport. The check-in time for domestic flight is 2 hrs before departure. End up sleeping in the airport while waiting after being out almost all night. Our relatives advised us NOT to bring too much money there as there’s nothing to spend. Since we must listen to elders, we obey. WE WERE SO WRONG! Upon check-in, we had to pay Rp50K for airport tax which we thought was included in the airfares. Then we had to put aside another 50K to get back. There already goes a large chunk of our “pun choy”/money*crry* Wasted the a whole day in Jogjakarta as it was spend sleeping the hotel. URGHHH! Spend the night in the newest mall next to the hotel. I know, typical city people eh? 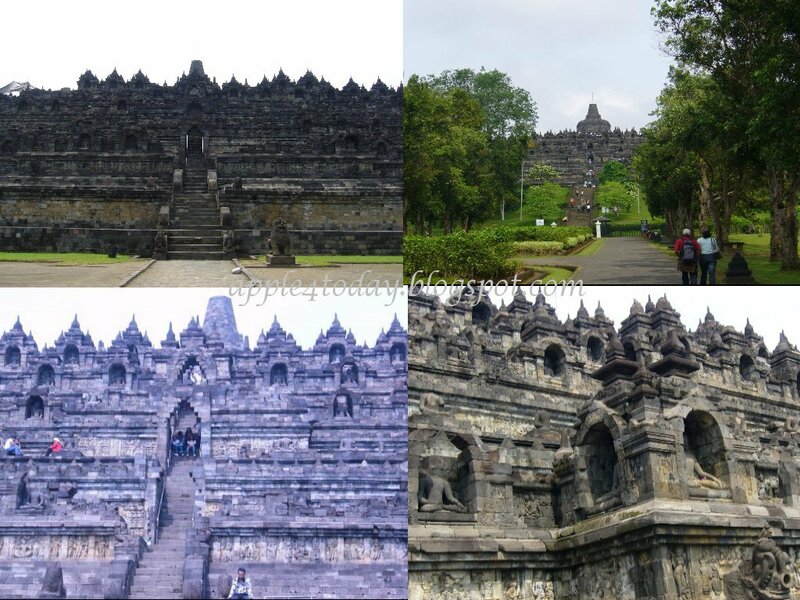 The tour really begin on the very next day where we planned to go all out! Our driver pick us up at 8am..we left at 830am*sheepish grin* in a Kijang/Innova. 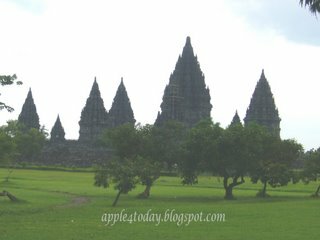 Sped off to our first stop, Borobudor. That alone took around 45mins-1hrs. The ticket is Rp10K = RM4 for local and USD10 for foreigneirs. For the thrifty us, of course we converted into Indonesians for the day. eheh It’s was a 3km walk from the carpark to the foothill. Along the way, there’s plenty of peddler trying to “con” us. The climb up to the top was tiring but undoubtfully, damn worth it. There’s plenty of ancient craving and each level is a totally different story. Looting is obviously serious here. 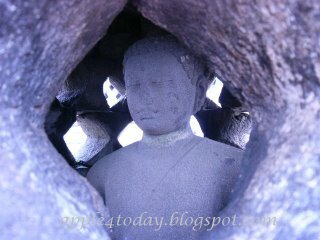 Most of the buddha’s head has been chopped off. Saddening. 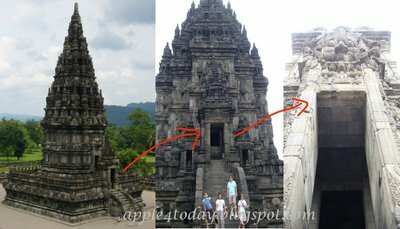 Next stop, Prambanan Temple situated east of borobudor, so the travelling took another 45mins. Along the way, we stop to refuel energy and visit a Silver Factory. Kinda famous there. 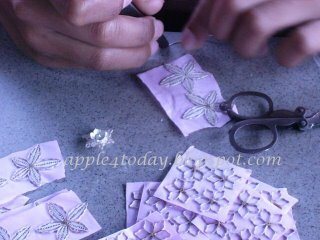 The products are very delicate and the price is cheap is you are earning USD. 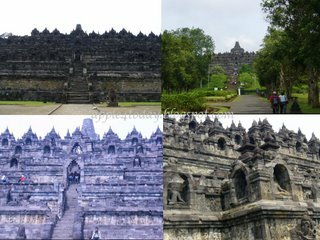 All this stupas are dedicated to individuals gods. So once u step inside thee mouth, there’s a huge statue inside and looks like a scene from Tomb Raider. We couldnt procede further as the passage is blocked and im too chicken. 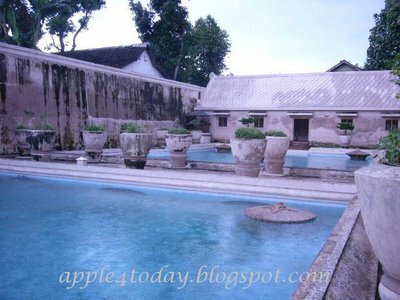 Next stop, Water Castle(Taman Sari) A nice place to visit and wonder about what the sultan in the olden days would do for luxury. It’s called water castle because it used to be surrounded by water/moat but after an volcanoe erruption, the sultan abandoned the place. Thats the Permaisuri-es bath tub while the Sultan will look from a watchtower and choose 1 to bath together in another private “tub”. It’s a very interesting place to visit will all the underground passage in this innocent looking garden. Half way touring, it rain cats and dogs so we have to “pit”. Again, we went to a mall and getting our hair wash and blow. Damn cheap. Great massage somemore just RM6. The night was spent in an rather expensive restaurant(sis treat but end up paying myself) and they have this javaness dancer dancing around while we eat. The next day was spent wastefully in the airport as my sis thought we were on an earlier flight 4 hours in the airport. But they have lounge and internet service(slower than snail carrying a tortoise) and it’s better than the new LCC. Total amount of RM left on the 5 of us: Less than RM10. ps: Click photos to enlarge. More in my photo album. Contact me if you want the link. 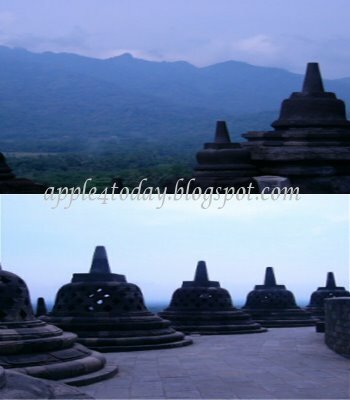 This entry was posted in Trotting the globe and tagged indonesia. Bookmark the permalink. USD 10 and RM4…i mati mati pun cakap gua pontianak lo! !